Club West, one of the top Phoenix, Arizona golf courses designed by Ken Cavanaugh and Brian Whitcome, can be as "user friendly" or as challenging as you want it to be. The beauty and serenity of Club West Golf Club, established as one of the premier Phoenix golf courses, puts your mind at ease. Located on the sunny side of South Mountain, the beautiful Sonoran desert surrounds you. The gorgeous surroundings of Club West Golf Club distinguish the course from other Phoenix golf courses as it has consistently been ranked in the top 20 golf courses in Arizona. Each hole at Club West is very distinctive with some dramatic elevation changes. The peaceful tranquility of each hole is enhanced by the fact that there are few contiguous fairways. Club West takes you far away from the hustle and bustle of the city lifestyle, although it is located just around the corner. With the Estrella Mountains in the distance and a light breeze at your back you can hear yourself think. An exceptional experience awaits you. 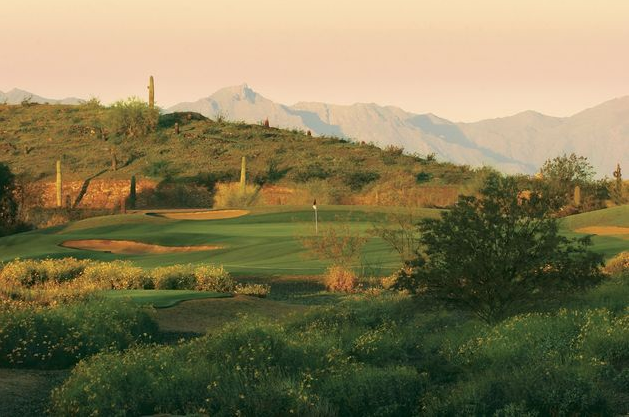 Come enjoy Club West and experience the pinnacle of Phoenix golf courses. Cart includes GPS Yardage System by ProLink.